4-lb density XPE foam smooth, easy to clean surface accepts labels. 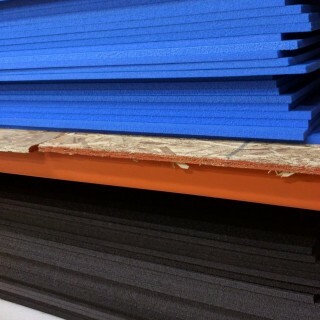 1/2" Black or 1/2" Blue Fire retardant Meets FAR certs. Adhere with 3M-90 spray adhesive. 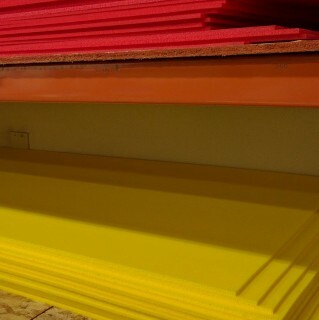 Special #10, 1/2" Black 6-lb PE, 49" x 53"
Dimensions: 1/2" x 49" x 54"
Foam sheets 27" wide x 108" long in Yellow or Red. Rolled for shipping via FedEx Ground additional. Standard 4# XPE not fire retardant. 4-lb XPE Value Line 1/2" Black laminated to 1/4" Yellow 27-1/2" x 42-1/2"
Dimensions: 3/4 x 27-1/2" x 42-1/2"
Special #8, 1/2" Black 6-lb PE 22-1/2" x 54"
Dimensions: 1/2" x 22-1/2" x 54"
Call 866-640-5764 now to order! Sheets may require cutting into smaller sizes for FedEx shipping. Cut charges may apply. Please call for details.